On September 8 – 9, we surveyed a number of stations along the Texas and Louisiana coasts that were in shallow water between 10-30 meters (approximately 30-100 feet). Interestingly, the number of sharks we caught at each station varied dramatically. For example, we pulled up 65 sharks at station 136 and 53 sharks at station 137, whereas we caught only 5 sharks at station 138 and 2 sharks at station 139. What could account for this large variance in the number of sharks caught at these locations? Weighing a bonnethead shark caught off the coast of Texas. One key factor that is likely influencing shark distribution is the amount of dissolved oxygen in the water. Oxygen is required by living organisms to produce the energy needed to fuel all their activities. In water, dissolved oxygen levels above 5 mg/liter are needed for most marine organisms to thrive. Water with less than 2 mg/liter of dissolved oxygen is termed hypoxic, meaning dissolved oxygen is below levels needed by most organisms to thrive and survive. Water with less than 0.2 mg/liter of dissolved oxygen is termed anoxic (no oxygen) and results in “dead zones” where little, if any, marine life can survive. As part of several missions, including the ground fish and longline shark surveys, NOAA ships sample the levels of dissolved oxygen at survey stations in coastal waters of the Gulf of Mexico. Measurements of dissolved oxygen, salinity, and temperature are collected by a device called the CTD. At each survey station, the CTD is deployed and it collects real-time measurements as it descends to the bottom and returns to the surface. 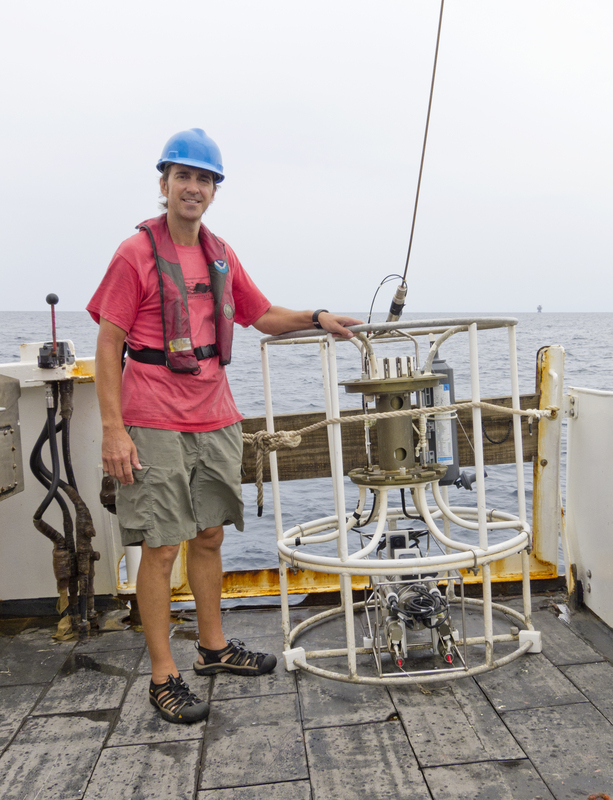 Standing with the CTD, which is used to measure dissolved oxygen, salinity, and temperature. 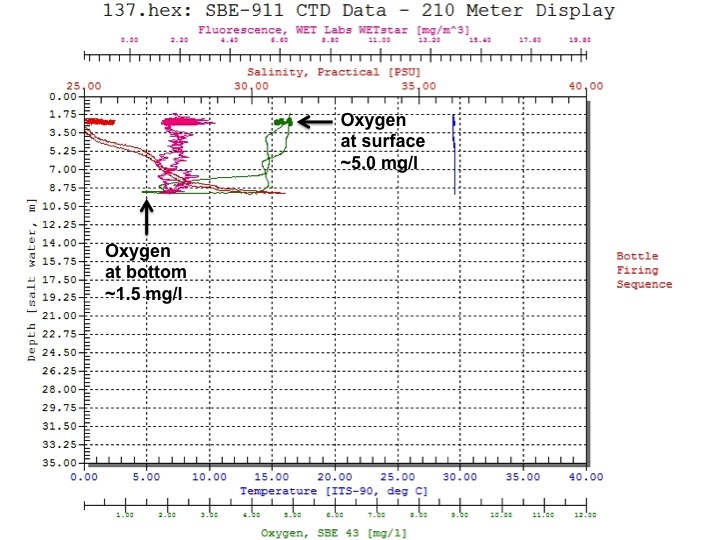 Data collected by the CTD is used to produce maps showing the relative levels of dissolved oxygen in coastal regions of the Gulf of Mexico. For more environmental data go to the NOAA National Centers for Environmental Information. 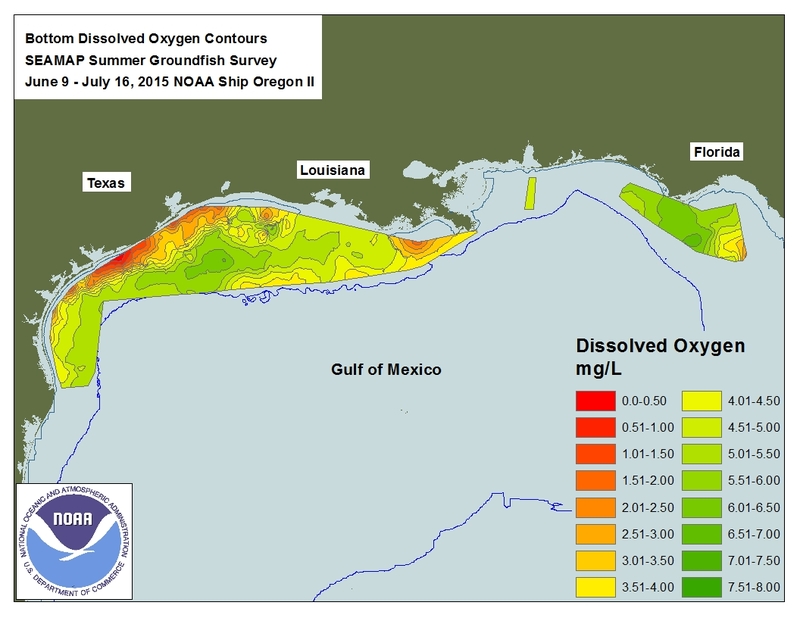 Map showing dissolved oxygen levels in the coastal areas of the Gulf of Mexico. Red marks anoxic/hypoxic areas with low dissolved oxygen levels. Source: NOAA National Centers for Environmental Information. Environmental surveys demonstrate that large anoxic/hypoxic zones often exist along the Louisiana/Texas continental shelf. Because low dissolved oxygen levels are harmful to marine organisms, the anoxic/hypoxic zones in the northern Gulf of Mexico could greatly impact commercially and ecologically important marine species. Overwhelming scientific evidence indicates that excess organic matter, especially nitrogen, from the Mississippi River drainage basin drives the development of anoxic/hypoxic waters. Although natural sources contribute to the runoff, inputs from agricultural runoff, the burning of fossil fuels, and waste water treatment discharges have increased inputs to many times natural levels. Map showing sources of nitrogen runoff in the Mississippi River drainage basin. Source NOAA National Centers for Coastal Ocean Science. Nitrogen runoff from the Mississippi River feeds large phytoplankton algae blooms at the surface. Over time, excess algae and other organic materials sink to the bottom. On the bottom, decomposition of this organic material by bacteria and other organisms consumes oxygen and leads to formation of anoxic/hypoxic zones. These anoxic/hypoxic zones persist because waters of the northern Gulf of Mexico become stratified, which means the water is separated into horizontal layers with cold and/or saltier water at the bottom and warmer and/or fresher water at the surface. This layering separates bottom waters from the atmosphere and prevents re-supply of oxygen from the surface. Since levels of dissolved oxygen can greatly influence the distribution of marine life, we reasoned that the high variation in the number of sharks caught along the Louisiana/Texas coast could be the result of differences in dissolved oxygen. To test this idea, we analyzed environmental data and shark numbers at survey stations along the Louisiana/Texas coast. 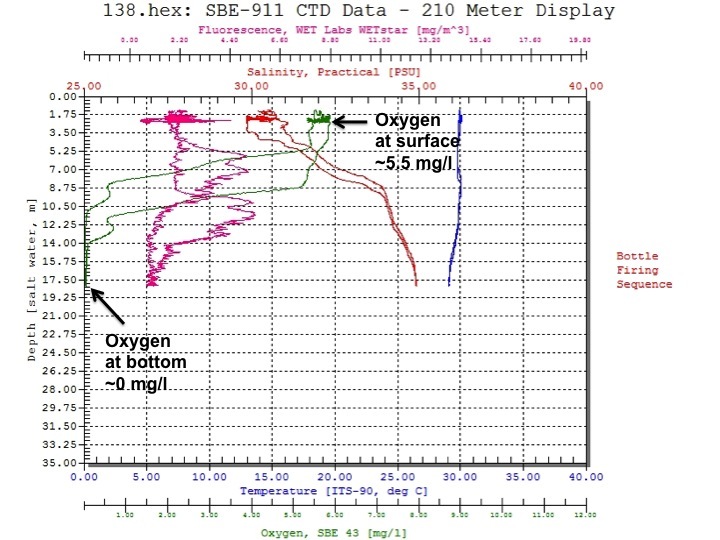 The graphs below show raw data collected by the CTD at stations 137 and 138. Dissolved oxygen levels at station 137 (green line; raw data). At the surface: dissolved oxygen = 5.0 mg/liter. At the bottom: dissolved oxygen = 1.5 mg/liter. Notice the stratification of the water at a depth of 7-8 meters. Dissolved oxygen levels at station 138 (green line; raw data). At the surface: dissolved oxygen = 5.5 mg/liter. At the bottom: dissolved oxygen = 0 mg/liter. Notice the stratification of the water at a depth of 7-8 meters. Putting together shark survey numbers with environmental data from the CTD we found that we caught very high numbers of sharks in hypoxic water and we caught very few sharks in anoxic water. Similar results were observed at station 136 (hypoxic waters; 65 sharks caught) and station 139 (anoxic waters; 2 sharks caught). Relationship between dissolved oxygen levels and numbers of sharks caught at stations 137 and 138. What can explain this data? One possible answer is that sharks will be found where there is food for them to eat. Thus, many sharks may be moving in and out of hypoxic waters to catch prey that may be stressed or less active due to low oxygen levels. In other words, sharks may be taking advantage of low oxygen conditions that make fish easier to catch. In contrast, anoxic waters cannot support marine life so there will be very little food for sharks to eat and, therefore, few sharks will be present. 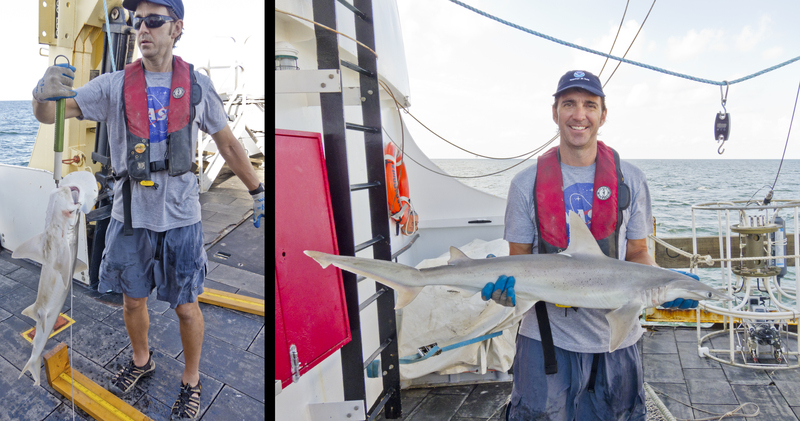 While this idea provides an explanation for our observations, more research, like the work being done aboard the NOAA Ship Oregon II, is needed to understand the distribution and movement of sharks in the Gulf of Mexico. My time aboard the Oregon II is drawing to a close as we move into the last weekend of the cruise. We have now turned away from the Louisiana coast into deeper waters as we travel west to Galveston, Texas. The weather has changed as well. It has been sunny and hot for much of our trip, but clouds, rain, and wind have moved in. Despite this change in weather, we continue to set longlines at survey stations along our route to Galveston. The rain makes our job more challenging but our catch has been relatively light since we moved away from the coast into deeper waters. Hopefully our fishing luck will change as we move closer to Galveston. I would like to wrestle a few more sharks before my time on the Oregon II comes to an end. This entry was posted in 2015, Jeffrey Miller, NOAA, NOAA Fisheries Service, NOAA Teacher at Sea and tagged Gulf of Mexico, longline survey, NOAA Ship Oregon II, shark. Bookmark the permalink. That sounds like a great expedition! The map of nitrogen runoff is mindblowing, how far the reach of one landowner can extend. This will be helpful in teaching water pollution in my science classroom.Thanks for sharing!